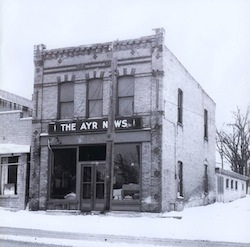 2013 marked the 100th anniversary of the Schmidt Family publishing the Ayr News! The first newspaper, the Ayr Observer, was published in August 1854 by James Somerville. While there has been a paper in Ayr since 1854, name and ownership changes were numerous until January 30th, 1897. That year, William Keyes purchased the newspaper and the Ayr News name has remained ever since. John A. Schmidt was born in Paisley, Ontario in 1890, the son of James and Elisabeth (Fink) Schmidt. John joined his father in the cooper trade at the age of 11 and learned the meaning of hard work. He subsequently became a grocery clerk when the family moved to St. Marys, Ontario. John was pursuing this trade in Galt when the Ayr News at 79 Stanley Street, came up for sale in 1913. It was purchased in partnership with his brother Alfred "Mooney" on October 1, 1913 from George Dawson. John A. came into sole ownership two years later when Alfred departed to enlist in WWI with the 33rd Regiment of Detroit and went overseas as bandleader of the 125th Infantry Band. At this time, all type was handset and ten hour days, six days a week was normal for most businesses. The modern linotype did not come into the office for another dozen years. John A. married Jessie Rathe of Ayr in 1920 and they had three sons John, Robert and James (Jim). All three apprenticed at the "News" with Jim starting in May 1942. John T. went on to become Farm Editor of the K-W Record and later the Calgary Herald.Jim married Lavina McCombs in June, 1951 and they had eight children: Paul, Kathleen, Elaine, Irene, George, Ann, Michael and Heidi. John A., Robert and Jim carried on the business. With the untimely death of John A. in January 1968 and Robert two months later, Jim became sole owner of the Ayr News. In December 1978 the "News" moved to its new plant at 40 Piper Street. While the newspaper itself has not been printed at the Ayr News plant since 1970, there is a full in-house printing operation. 1993 saw Jim presented with a "Gold Quill" by the Canadian Newspapers Association, in recognition of 50 years in the newspaper business. In May 2013, Jim was inducted into the Waterloo Region Hall of Fame. Other Schmidt family members presented with a Silver Quill include: George, Ann and Heidi. Heidi was presented with the Ontario Community Newspaper Volunteer Award in 2011. In 2013, the Schmidt family celebrated its 100th anniversary of its ownership of the Ayr News. Jim Schmidt penned "100 Year Trip with the Schmidt Family and the Ayr News Weekly Newspaper, 1913 to 2013". 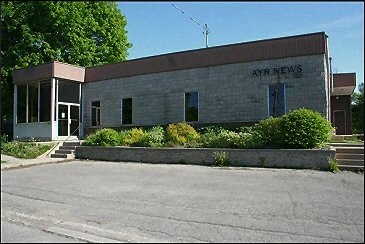 In 1997, Jim Schmidt authored "1897 - 1997, 100 Years of The Ayr News and Ayr".